Here are some "must see" sites. These are people who can provide you with the information or tools critical to Survival. Just click on the name to visit their sites. About a year ago a customer of ours, who works in Federal law enforcement, contacted me to tell me about the greatest "concealed gear carry garment" to ever be invented. Not long after that our friend, Steve Doran, who is now the head of Security for the 1,400 man University of California police force, told me about the same product. To say I was intrigued is an understatement. We had been looking for the ideal carry system for our new "Urban Master" series and this seemed like just the ticket. I contacted Scott Jordan owner of SCOTTeVEST and ordered two units. They were ideal for our purposes. With more pockets than a Jeep Cherokee these vests are actually jackets with zip off sleeves. We’ve traveled extensively with them and they never seem to wrinkle or show dirt. Soon you’ll see them in action when we take them to Johannesburg, South Africa where we will film the last scenes for the Home defense video. Meanwhile… toddle on over to their site and get your hands on one. I guarantee that you will be thrilled with the design, utility and look of these jacket/vests…. Almost three decades ago I found my first book by Kurt Saxon. Fascinated, I continued to buy everything he produced in the following years. Kurt is the epitome of a Renaissance man. His skills are legendary and his writings and research is prolific. When I found that Kurt had his own website I jumped on it like a dog on a bone. His preparedness site is filled with good readings and hard won knowledge. Better yet Kurt has made his material available on CD’s so you can read through his research and save some serious cash besides. I have most of what he printed but now I have the whole kit and caboodle on CD where it’s a LOT easier to find information. I strongly recommend that you drop by his website, learn a bunch and then get your hands on his wisdom by buying his CD’s. Have fun! I’ve been doing business with Shomertec since well before we started producing videos. These folks feature some of the most astonishing and interesting tools and gear you can ever imagine. Their prices are great, the service is superb and the selection is mind boggling. They feature everything from the most basic wilderness gear to the most sophisticated electronics and "spy gear". When you call these folks you will speak with a person who really knows the gear they sell… inside and out. Check them out! 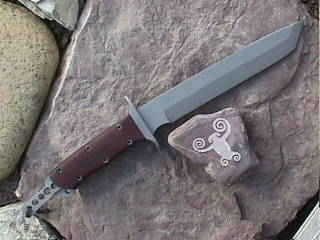 Trace Rinaldi made the big custom blade we used in our latest production "Solo: The Quest for Survival". A review of the performance of the blade can be seen on our site HERE . Trace puts together some astonishing blades with incredible performance. If you want to see his line up of designs, check him out. If you are even thinking of getting one of his blades, order it now. It won’t be long before he’ll be too busy to take orders. Mick Chesbro is a contributing member of our forum. I can say a lot about Mick but all of it is good ;>) . Jump on over to Micks Lodge and check out the books he has written. I just finished "Privacy for Sale" and had already read "The Complete Guide to E-Security". These are "must get" books. When you finish you will understand a lot more about the threat of today’s E-World. His site will give you a good start on the road to security. Trust me, he IS an authority AND knows what he it talking about. His stuff rocked my world. If you want to really learn from this master you can scroll down THIS page and order them right from here. Some time ago one of my favorite magazines, American Survival Guide, disappeared from the newsstands. It was a loss. To be fair the magazine was becoming less representative of the needs of it’s readers but that was not the fault of the editor, Jim Benson. Now that American Survival Guide is gone. Jim has started up his OWN magazine. True to his pioneering spirit, Jim has a new online magazine and it is a beauty. Check out Modern Survival and subscribe. You’ll be glad you did. If you have any of our recent videos you probably noticed a folding blade making frequent appearances. It’s the Al Mar "Eagle" model folder. I’ve been using an Al Mar "Eagle" as my daily carry, in the field as well as at home, for over two years now. I can’t tell you how happy I am with Al Mar products. Since I was so happy with mine, I got Karen one of their knives as well and I can think of no better locking folders. Check out their site and their products. If you order one I KNOW you’ll be happy. If you have an interest in things primitive, old, alternative or just plain interesting, this is the magazine to get. It also happens to be my favorite magazine. Two old friends Charlie and Lynn Richie have been working this bi-monthly magazine as a labor of love for many years. Trust me when I say that this is a MUST for anyone interested in innovation and old fashioned skills. These folks are the focus of our Volume 9 Primitive knifemaking video. We searched high and low to find the best and most capable primitive knife making folks and we found two of them in Tucson AZ. Tai Goo and Tim Lively (click the name to visit their sites) are both highly skilled professional metalsmiths and highly regarded by their colleagues. If you are interested in learning about turning junk into things of value… you have to visit their sites and join their online forum. Believe me when I say that being able to metalsmith is one of the fundamental survival skills. So we came out with our Knifemaking video and Rik Palm, one of our video students took a look at the video and got the bug. Then Rik decided to join us in the mountains for the making of Volume 10 (Survival Camping). There we made a wilderness forge and Rik got to rub elbows and practice with Rob Simonich. The magic of Witch Blade grew from the mix of Riks amazing artistry and the mystery of the flame! A new artist in the world of metal forging emerged. One of my favorite tools is called the "Fire Genie". You’ll see it in the opening of Volume 10. Check Rik out and get one of his pieces now… Next year you won’t be able to afford it! As we have said before, the knife — after your knowledge — is the most important tool you can have in a survival situation. Mike Fuller of Tactical Operations Products (TOPS) has a terrific lineup of blades. Unlike some companies that import knives, TOPS enlisted the support of five special operations experts who used their combined knowledge, experience and operational know-how at the "sharp end" to design the ultimate knives suitable for virtually any survival or tactical purpose. We also chose Mike and TOPS to create our custom Anaconda 7 & 9 survival blades as well as the new ATAX tool. This exclusive tool is made on Ron Hood’s design and features the most desirable traits of a multipurpose survival tool AND, when you check out our details on the Anaconda… you’ll understand why we recommend the Anaconda to all of our clients. Rob Simonich is a master custom knife maker. Rob crafts his blades with the care and precision of an artist. When you take a look at his website you’ll come away with the same feeling I had when he and I first talked, he loves to make knives and he loves the knives he makes. Recently Rob finished a special design for me. Click over to his site and take a look at the Works in Progress section and you’ll see the "Nordooh" blade. Soon you’ll see the next project we’re working on… the "Nerak". If you have a dream blade, this guy can put your dream into steel. I strongly recommend you contact Rob for a blade before he becomes so famous you’ll never be able to own one! Take a look at the finished Nordooh. I’ve been using it in our Woodsmaster Volume 6 video, Primitive Weapons. It is a dream blade. The parasite blade is a handy little carver/skinner concealed in the Micarta handle and ready for instant use. You can have Rob custom craft one for you. Pick the steel you like, the handle, the blade length… At Rob’s place you can "have it your way." The Nordooh with the Parasite companion blade partially visible.